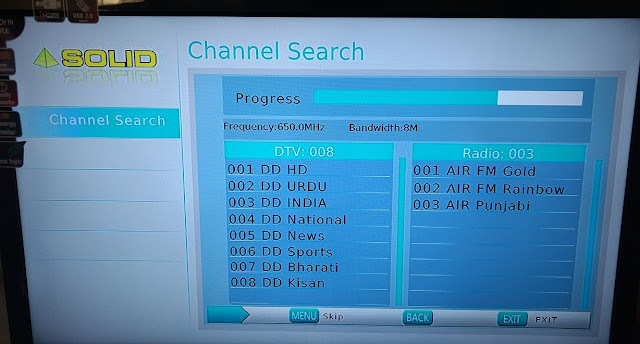 In earlier DVB-T or DTT analogue transmission, only one channel (Doordarshan National) can be transmitted through a transponder whereas in case of digital transmission (DVB-T2), multiple channels can be transmitted. This digitisation could also open the possibility of new channels catering exclusively to cities same as FM channels with local programs, advertisements, weather reports and other public related information. Here are list of Digital DVB-T2 transponders which are recently installed in India's main cities. These channels can also receive by DVB-H / DVB-T2 mobile USB dongle. It is easily available on local electronics shop or online marketplaces like Amazon, If you want to buy DVB-T2 Set-Top Box then you can visit Solid official website. Please give us your feedback's on this post.